Over a big enough span of time every room in your house will eventually need to be renovated if you want it to stay looking good. Your bathroom though can may need it sooner rather than later: humidity, leaks, and use can degrade it faster than almost any other room in your house. But for those of us on a budget, this presents a problem. How do you both update your bathroom without also spending an arm and a leg? Luckily, there are a variety of answers to this question. So long as you’re willing to put in the legwork and think outside the box, it’s a goal that’s entirely attainable. Here’s 5 of the best ways we’ve found to update your bathroom on the cheap. If you’re looking for a low intensity option, this is it. Fixtures in a bathroom are what immediately catch the eye, and by upgrading just those you can give the whole room a new glow. New fixtures can be expensive, but there’s no need to get fancy with them. Pick ones that are simple and clean and match the decor that’s already in place. 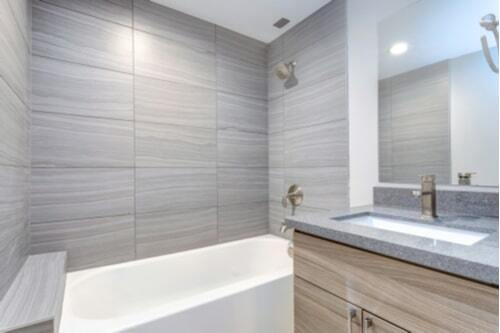 While a new tub or toilet or sink will always look better than the old, that doesn’t mean you necessarily need to replace them to make your bathroom look better. It’s expensive to do so, and most of the time resurfacing or refinishing will give you 90% of the quality at a fifth of the price. 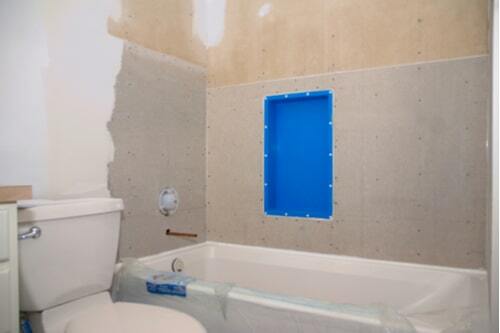 Tub liners are also a product that can be a cheap substitute for replacement. They’re a solid film that’s dropped over an existing bathtub or shower to make it look good as new. Not only are green upgrades like low-flow sinks and shower heads good for the environment, but they will also save you money on your water bill in the long-term. 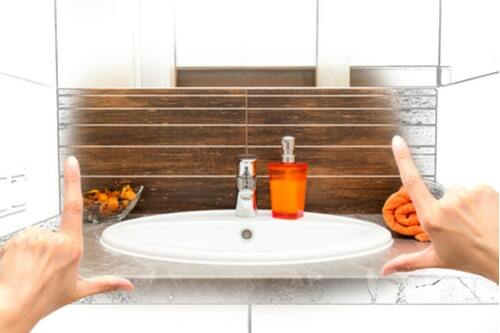 Other environmentally friendly bathroom upgrades that can save you money are energy efficient vent fans, motion sensing faucets, and LED light bulbs. Each will cut down on energy costs so your electric bill come in a little cheaper each month. Buying used will always be cheaper than buying new, no matter whether the quality gap is wide or narrow. And if you’re ready to think outside the box, that gap can be narrowed easily. Patience and knowing where to look is the most important part of buying used. Not only should you trawl through your local consignment stores and garage sales, but sites like Craigslist can be great resources to find elements for your improved bathroom, too. The most important tip when it comes to keeping costs down when renovating is not to spend what you don’t have. While home renovation will almost always raise the value of your home in the long-term, in the short-term, you shouldn’t go into debt over it. Credit cards and short-term lending like car title loans are useful in emergency conditions, but aren’t great options for funding home renovations. Plan ahead and save money so that you can get the bathroom you want without going into debt over it.